A while back, I received an email from a neighbor. She said she and her husband found an album of photographs in the street near Merrill Field. The couple suspected the album had fallen out of somebody's car. They hoped I could reunite the photos with their owner. I said "I'll try," and met the couple at Denny's to pick up the pics. The small pink-and-white album contained about 80 photographs, almost all black and white, mostly from the late 1940s and early 1950s. The album was new: The photos had been removed from an older album and recently placed, one after another, in the clear sleeves of this one. The earliest photos were baby pictures of a young couple's first child, Tom, who apparently was born in 1947. The boy's name appeared many times on the front and back of photos. The couple adored their son — that's the unspoken takeaway from the photos of Tom as an infant, a small boy learning to walk who visited his grandparents, a growing boy with his dog, a kid excitedly blowing out the candles on his birthday cake. The photos were not taken in Alaska. Most were from California, I guessed and later confirmed. This was the Golden State of Californians living the post-World War II dream of expanding affluence, new homes, new cars — freedom from want unknown during the Great Depression. The family owned a big Studebaker and apparently traveled. A few of the photos were from Pennsylvania, a couple others from Idaho. There must be millions of postwar American photographs similar to these: Photos of the lovely child, the proud parents, the thrilled grandparents, the holidays, the family gatherings, the loyal dog. Families don't put together photo albums for strangers like me who come nosing around more than half a century later. They aren't concerned about history. So they don't annotate the photos like a historian would — the date the photo was taken, where it was taken, who is in it, who took it. No historian writes "Me" on the back of a photograph. But "Me" must appear on the backside of photographs from coast to coast. The photos in the pink-and-white album brought to my mind Evan Connell's novel "Mrs. Bridge." Late in the novel, after India Bridge's two daughters and son have grown up and left home, after her husband has died, Mrs. Bridge discovered that her photo albums "provided many comforting hours. There she could find her children again, her husband too …" Mrs. Bridge had photos of her trip to Europe, "But the pictures to which she returned most often for her own pleasure were those of the family; they evoked what she had known most intimately, and all that she had loved most profoundly." On the back of one of the photos of Tom, I found his last name joined with his first name — Tom Wanless. Fortunately for me, Wanless is not a common name. Looking for Tom Wanless is not looking for John Johnson. I searched for "Tom Wanless and Alaska" on the net. He died here recently, age 71. The Anchorage Daily News ran an obituary that also contained his parents' names, Lewis and Mary Wanless. Tom's Anchorage friends held a memorial service at a hangar near Merrill Field. Hence the photo album in the street. The obit mentioned several friends. I called one; he came over the same day, and I handed him the album. If you go to antique emporiums, junk stores, previously owned shops — called them what you will — you often find old photographs for sale, especially in California. Sometimes there are boxes of single photographs, sometimes albums that belonged to families, sometimes institutional photos. In Santa Barbara, I found photos of all the students in a Los Angeles elementary school in 1956. The kids would be more or less my age today. That sparked my interest. But what would I do with these photographs if I bought them? I can be obsessive about reconstructing history, but I am not going to reconstruct the history of all those kids in the photographs. The photos would wind up in a box in my garage. In the novel "The Real Life of Sebastian Knight," Vladimir Nabokov tells a story about a man who is writing a biography of his half-brother, Sebastian Knight. Sebastian, a misunderstood, misrepresented novelist, has died and after his death (1936), the half-brother goes through Sebastian's apartment, looking in closets and poking in drawers out of curiosity but also attempting to visualize the world as Sebastian saw it. 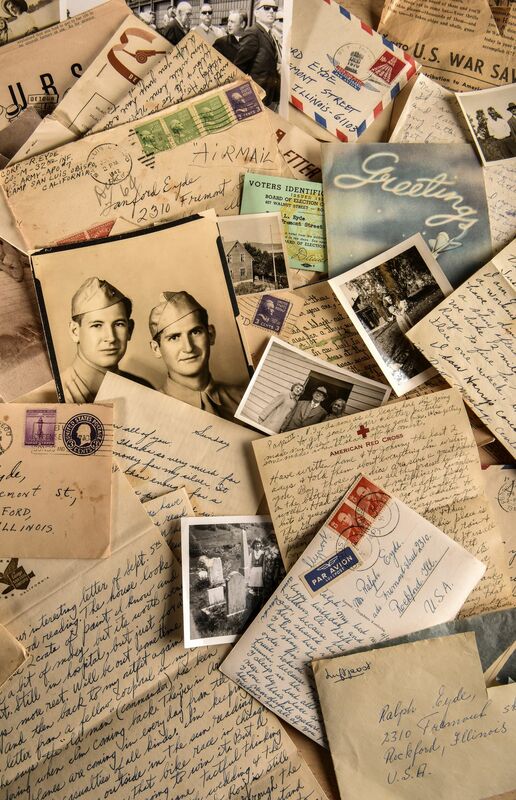 The half-brother finds an envelope of photographs — no surprise. Almost everybody has at least a few photos. Even old miners who died broke at Manley Hot Springs and Rampart had them — photos of their family in the States, Europe, Australia. This envelope is marked "Mr. H" in Sebastian's hand. The half-brother, acting as narrator, says the photos "all featured one and the same person at different stages of his life: First, a moonfaced urchin in a vulgarly cut sailor suit, next an ugly boy in a cricket-cap, then a pug-nosed youth and so on til one arrived at a series of full-grown Mr. H. — a rather repellent bulldog type of a man, getting steadily fatter in a world of photographic backgrounds and real front gardens." Who was Mr. H? The half-brother found a newspaper ad attached to a photo, "Author writing fictitious biography requires photos of gentleman, efficient appearance, plain, steady, teetotaler, bachelors preferred. Will pay for photos childhood, youth, manhood to appear in said work." Nabokov is writing a novel — fiction — in which a novelist is contemplating writing a novel — fiction — using photographs of a man who is fictitious to illustrate the novel. Would a real person run an ad like this soliciting photos? Possibly — that's what makes the fiction plausible. People impress their imagination on reality in surprising ways. Would a real person respond to an ad like this? Well, the term "real person" is making me unsteady. I am having trouble maintaining the line between real and unreal. Mr. H., who exists only in a book, responded to the ad, but his creator leaves us to guess why. The money, which must have been modest? Satisfy his curiosity? Catch the world's attention? Break away from the boredom of the daily routine? He might have been drunk, ignoring the request for a teetotaler. But he certainly wasn't as drunk as men who run out to the pitcher's mound at the ballpark in the fourth inning and then go home to watch their ludicrous antics on late-night news. Maybe Mr. H. concluded (that is, his creator concluded for him) a fictional life would do more for him than the life he is living while "getting steadily fatter in a world of photographic backgrounds and real front gardens." Rod Stewart had a big hit with "Every Picture Tells A Story." Wrong. The picture doesn't tell the story. Those looking at the picture tell the story.